Vancouver, British Columbia, Canada. February 3rd, 2011, Columbus Gold Corporation (CGT: TSX-V) ( "Columbus Gold") is pleased to announce that a drilling program is planned to commence in the first half of this year on its Summit gold project where immediately to the south, Fronteer Gold Inc. ("Fronteer"), has updated the gold resource estimate at its Long Canyon project to 1.4 million oz. measured & indicated (18.4M tonnes at 2.36 g/t) and 800,000 oz. inferred (11.2M tonnes at 2.24 g/t); see press release of Fronteer dated January 18, 2011. 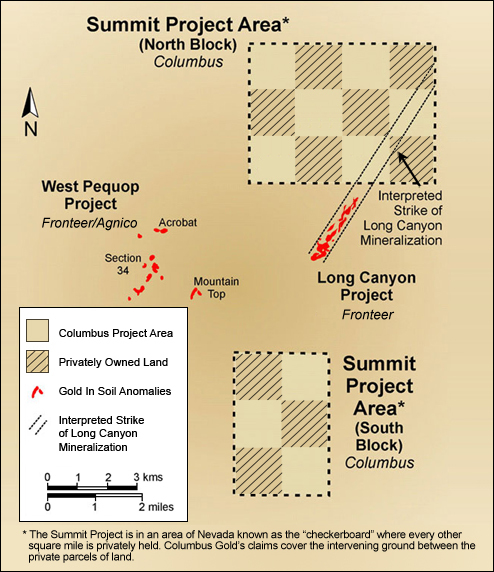 Drilling by Fronteer at Long Canyon is now only approximately 1,500 feet (457 meters) away from Columbus Gold's Summit property boundary. Agnico-Eagle can earn an initial 51% interest in Summit by completing $3 million in exploration expenditures.